The 1MB sample ROM doesn't mean the expandable memory on the card. Who was talking about the ROM here...? The AWE64 came in three versions initially: A "Value" version (with 512KB of RAM), a standard version (with 1 MB of RAM), and a "Gold" version (with 4 MB of RAM, high quality 20bit DAC and a separate SPDIF output). Possibly. I think I may have seen one, but I may be making this up because I read it on Wikipedia or something . And that's how vintage hardware myths are born. By playing telephone. Quite a few times indeed. I'll try to dig some info on this. Okay, CT4380 and CT4381 seem to be these "standard" AWE64. The 1MB versions were somewhat uncommon. Most AWEs I saw were values. A few people bought the AWE64 Gold. I think at that time people didn't care much about midi anyway. I doubt the wavetable on the standard version was much better than the 512k version anyway (which sounded worse than FM). The ROM (i.e. for the AWE option in games) was the same on all cards. The RAM is for soundfonts (GM option). Is there a definite answer on this? Namely, do the CT4380 have 1MB of RAM or 512KB? The Nerdy Pleasures blog claims they are different, but the quoted post from there suggests that maybe it's wrong. I recall reading a different source the claimed that the standard version (CT4380) was simply renamed "value" in later revisions (CT4500/CT4520), but that there are no actual differences in RAM or other key parameters. I would edit Wikipedia to remove the information if it is indeed erroneous, but would like to be sure. CT4500 is an 1MB AWE64 Classic. 256K * 16b makes it 512KB. The other CT4380 on that page has a different chip, but same configuration. The "Value" variants - CT4500 and CT4520 - appear to have different chips yet again (by NEC/NPN), but they each seem to be the same 512KB configuration. The "Gold" has two 1M by 16b chips - 4MB RAM. 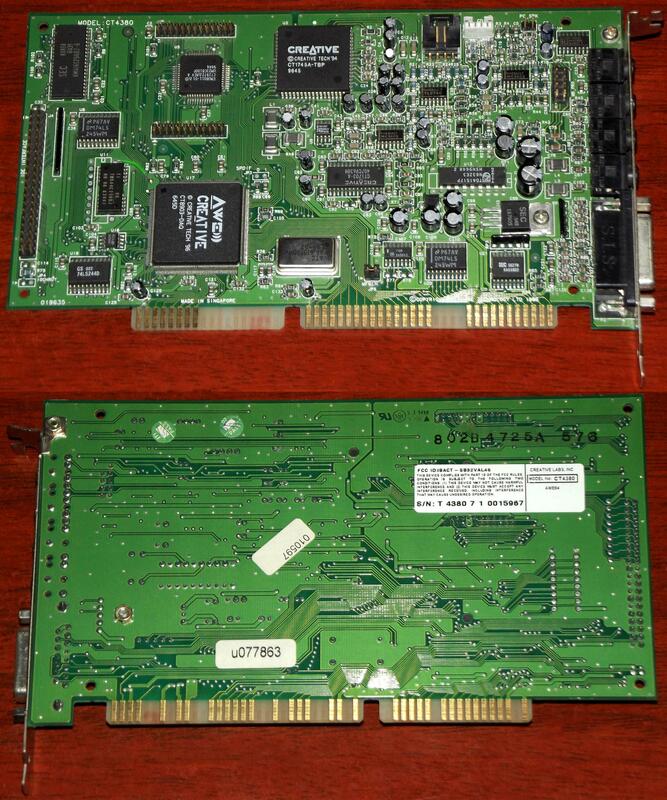 There also appears to be a smaller 128KB chip (256K*4b) on each of these cards. Not sure what its purpose is. So, in the end it seems like the commonly referenced info is indeed wrong, and there is no 1MB RAM variant of the AWE64. Unless it is some very obscure one. The difference between the CT4380 and the relabeled CT4500/20 seems to be the IDE interface (although not all CT4380 actually had the connector, they all had the placeholder on the board for it). Yes you are correct. By chip values there is no 1MB AWE64. Even the CT4500 has 512k , but no VALUE text written. There must have been an important piece of misinformation, even back in the day because I have come across very, very old forum posts by coders who were also trying to figure out why their "1MB" AWE64's were experiencing all sorts of problems when trying to access over 512KB. I think it's safe to assume a 1MB does not actually exist. OK, then. Since there appears to be no evidence to the contrary, I've edited the Wikipedia page to remove reference to the 1MB variant. I'll inform the Nerdly pleasures blog author as well. Thanks, guys.